The product weighs 255 lbs. and may require the use of a lift gate. If you do require a lift gate at your delivery, you'll have the option to add this FREE of charge when you checkout. 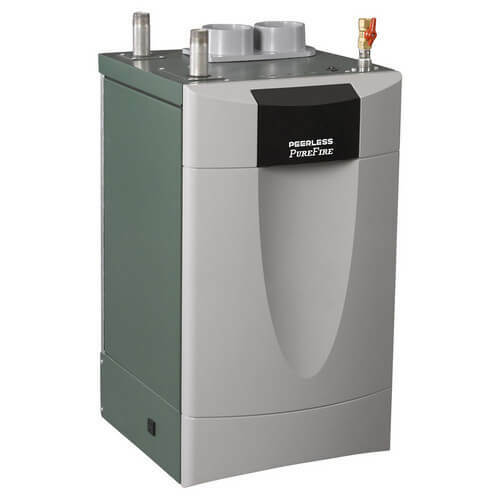 The Peerless® PUREFIRE® gas-fired condensing boiler is a high-efficiency boiler for residential (PF-50, PF-80, PF-110, PF-140, PF-210) and commercial applications (PF-399). The direct vent, sealed combustion boiler is ENERGY STAR® approved and has ASME and ETL certifications for both the U.S. and Canada. PUREFIRE® is the most thoroughly tested high efficiency boiler on the market! A unique condensate system with built-in neutralizer component and float switch protection is a top feature of the boiler. The PUREFIRE® boiler is made in America. Other great features include a high grade stainless steel burner and heat exchanger, 120 volt convenience outlet and LoNOx operation for the good of the environment. The PUREFIRE®'s fully modulating burner assures dependable operation and maximum boiler efficiency. Zero clearance to combustibles, easy access to controls and leveling legs are other standard features that allow for ease of installation and maintenance. Boilers are easily converted from LP to natural gas and from natural gas to LP without any additional parts. The PUREFIRE® is equipped with a full one-year parts and labor warranty. All Peerless® PUREFIRE® gas boilers are equipped with a state-of-the-art control board that offers modern technology such as an outdoor reset control with an additional outdoor temperature sensor and is cascade capable for operation of up to 16 units as a single module. The control board also has built-in technology for domestic hot water priority and an energy saving heat recovery function that improves hot water performance and reduces off cycle losses. Standby temperature of domestic hot water is controlled by economic low fire operation. Additionally, the control board's LCD status display module uses plain English for easy-to-read status and troubleshooting text while a switch to "system test mode" enables contractors to manually control the firing rate. Boiler has 3 to 1 flame modulation to assure dependable operation and increase boiler efficiency. Dual flame sensing promotes reliable firing and safe operation. Uses standard schedule 40 PVC plastic pipe for venting.